1. Freestanding soaking tub offers a restful soak that may soothe your jangled nerves better than a noisy whirlpool. Install a decorative light fixture overhead to create a focal point in your bathroom–a rich visual that exudes style, elegance, and sophistication. 2. Walk-in shower with a frameless glass enclosure or an open doorless shower–both provide a welcome sense of expansiveness. A rain head fixture mimics the gentle caress of a warm summer rain shower, while body sprays and a handheld shower direct a more forceful flow of water to specific areas of your body. 3. Steam shower helps relieve tension through moist heat. Essential oils used for Aromatherapy can be dispersed through the steam outlet. 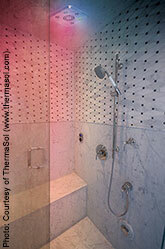 The shower may also be equipped with an LED Chromatherapy lighting system. 4. 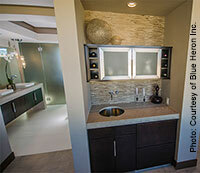 Double sinks or double vanities offer the convenience of personalized grooming stations. Storage space designed to fit your particular needs can bring a more positive start to your morning. Delight your visual senses with unique sinks that may include cascading water features. 5. Separate toilet room allows for privacy when there is more than one person using your master bathroom. Design this room to be comfortably large and introduce natural light through transom windows or tubular skylights.6. Large format porcelain tile with the look of limestone or marble provides an elegant, yet practical alternative to natural stone. For bathroom floors, choose a tile with sufficient traction. 7. Electric radiant underfloor heating offers the luxury of stepping onto a warm tile floor after showering or bathing. Certain heating mats are safe for wet locations, so you can even warm your shower bench and shower floor. 8. Beverage bar lets you have your first cup of coffee while getting ready in the morning, without having to leave the bathroom. Or you can relax in bed with a glass of wine and a good book, before calling it a day. 9. Television–wall mounted flat screen or hidden in a mirror–will let you catch up with your favorite show. It is advisable to select a waterproof flat screen TV for bathroom installations. 10. Large window openings and glass exterior doors contribute natural light, ventilation, and access to inspirational views of the outdoors. The doors could also lead to an outdoor shower or patio.